If you're looking for one of the sweetest (and best!) beauty publicists around, look no further than Jenna Muller. I've been working with her for years, mainly because she represents some of my all-time favorite brands (Lierac and PHYTO!). She's whip-smart, unbelievably friendly ... and she just happens to have AMAZING hair. 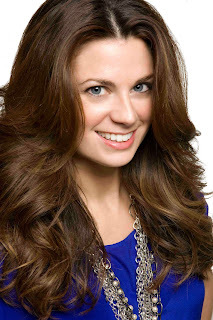 Recently, she branched out on her own and created Jenna Muller Communications. Read on to find out how she got her start in the industry, which cleanser she can't live without and so much more. I was born and raised in Smithtown, NY which is on the north shore of Long Island, Suffolk County. I loved growing up on Long Island because we were so close to the beach. I had a great childhood, but I’m truly a city girl at heart. All I wanted to do was live in NYC and be where the action is. I went to college at Hofstra University (which is also on Long Island, even though I probably looked and applied to 20 schools around the country!). I majored in International Business with a minor in French and Dance, which is my first love. How did you first become interested in beauty, and what led you to work in beauty PR? I believe beauty PR found me! In college I was interested in finding a position in either the fashion or entertainment worlds, and I was offered an internship in the PR department at Guess? Inc. I learned so much about what public relations is, as opposed to marketing and pure advertising. Interning is such an integral part of the learning process, so I highly recommend it to everyone. From there, I continued working in fashion and accessories PR at Tommy Hilfiger and Marchon Eyewear, which owns the licenses for Calvin Klein, Fendi, Nike and many more. In 2003, after a meeting with the previous President at Ales Group, USA, the company who manufactures and distributes the beauty brands PHYTO, Lierac Paris and Caron, I was offered the opportunity to run their PR and advertising department. Since all of my contacts were in fashion and accessories at the time, it was a challenge because I had to start from scratch familiarizing and networking myself in the beauty space. I’m always up for a challenge, so I accepted! I’ve been lucky enough to represent these brands for the past 8 years ... and counting! Today, I’ve branched out on my own but I would never be where I am today without these experiences and support of my former bosses, family and friends. What is your favorite part about working in beauty PR? Any highlights throughout your career? What’s not to love?! To be honest, the people. From editors, writers and bloggers to hairstylists and makeup artists, as well as all of the internal teams that make this industry click. I’m in awe of everyone’s talent and look forward to seeing which new innovations and products are launching next. I’ve been lucky to have had so many amazing experiences throughout my career -- from working on large scale worldwide PR events to visiting labs in Paris to working backstage at NYFW, the Grammys and Primetime Emmys. However the most prominent highlight is simply knowing and working for Mr. Patrick Ales, the founder of PHYTO. He started his French-based company in the 1950s and he’s still running his company today. He’s 82 and it’s his baby. Even though the Ales Group is a large global company, it’s still run like a family owned business. And after all of these years, I feel like one of the family. Just recently, he sent me a handwritten note thanking for me for one of the editorial pieces I worked on. You can’t put a price tag on that! I’m truly honored and humbled to work in this industry and represent a visionary man and legend like him. What are your 5 favorite products? 1) Maybelline Lash Discovery Waterproof Mascara in Very Black. I’ve been using the waterproof version for years and years. Can I add my eyelash curler in too? They’re friends. Shu Uemura. A beauty must-have. 2) NARS Lip Gloss in Risky Business. I’m a lipgloss junkie and this one is a fave. 3) PHYTO Phytojoba Intense Hydrating Shampoo. Not only because I represent this brand, but I love the scent. Every time I use it, it reminds me of the beach. Close your eyes, take a sniff and transport yourself! If I wasn’t working with the company, I’d still buy this shampoo. 4) Gucci Guilty. My go-to. Love the packaging too. 6) I think I’m over the limit, but I also enjoy my Clarisonic. Yes, it’s definitely fun but it’s also a lot of work! With any job you need to love what you do and be passionate about the brands you represent. In my spare time (when I find some! ), besides hanging out with hubby, friends and catching up on my shows (Homeland, Smash and Nashville! ), I also teach barre3 classes. Growing up dancing, I missed being in a studio environment. When I teach (or take class) it’s my creative outlet and gets me out of my head. The hour flies by. I’m also kind of obsessed with music, so making playlists for class is my fun. Oh and karaoke. When I saw the photo, I wanted to comment and say what a lovely hair you have ! And here you are mentioning : PHYTO Phytojoba Intense Hydrating Shampoo, do you use it along with hair conditioner ? or alone? Hi Dima -- Unfortunately I'm not sure if Jenna also uses the conditioner, but thanks for your question!